WASHINGTON, D.C. -- Approximately half of U.S. adults believe women have equal job opportunities as men, although women themselves (43%) are significantly less likely than men (61%) to agree. The 52% of U.S. adults saying men and women have equal job opportunities is down slightly from 57% in 2008, mostly related to a decline in the percentage of men who hold this view. When Gallup first asked this question in 1987, 48% of U.S. adults believed women and men had equal job opportunities. The public grew more skeptical about gender equality in job opportunities, and by 1995, only 34% said they believed women and men had equal opportunities. That figure has increased steadily to a high of 57% in 2007 and 2008. These results are based on Gallup's 2016 Minority Rights and Relations poll, conducted June 7-July 1 with more than 3,200 U.S. adults, including approximately 1,500 women and 1,700 men. A separate question from the poll shows six in 10 U.S. adults favor affirmative action programs for women, on par with the 59% who supported these programs in 2005, when Gallup last asked this question. Women (64%) are more likely than men (55%) to favor these programs, but the percentages of men and women favoring these programs are essentially unchanged from 2005. Members of underrepresented minority groups are more likely than whites to report favoring affirmative action for women. Eighty-one percent of blacks and 69% of Hispanics say they support these programs, compared with 55% of whites. The percentages of these minority groups reporting they favor these programs for women remain similar to those found in 2005. With 52% of Americans reporting that women in the U.S. have equal job opportunities as men, it is clear that concerns about gender equality in the workplace still exist, despite progress on many fronts over the past three decades. 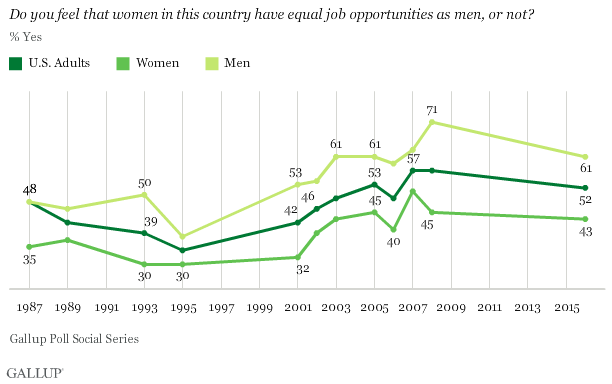 Perceptions of gender equality increased slightly in 2007, but Gallup data suggest this progress lacked staying power. Similarly, previous Gallup research found that women were more likely than men to report that they were denied a raise because of their gender, suggesting a gender gap still exists both in the opportunities available to members of each gender and in the experiences they have upon employment, including pay and promotion. The outcome of the 2016 presidential election could affect Americans' perceptions of whether men and women have equal job opportunities. Hillary Clinton is now the first woman to be a major party's presidential nominee and could potentially be the first female president. This could signal to the public that women have equal job opportunities as men. Results for this Gallup poll are based on telephone interviews conducted June 7-July 1, 2016, with a random sample of 3,270 adults, aged 18 and older, living in all 50 U.S. states and the District of Columbia. For results based on the total sample of national adults, the margin of sampling error is ±3 percentage points at the 95% confidence level. For results based on the total sample of 1,513 women, the margin of sampling error is ±5 percentage points. For results based on the total sample of 1,755 men, the margin of sampling error is ±4 percentage points. For results based on the total sample of 1,320 whites, the margin of sampling error is ±4 percentage points. For results based on the total sample of 912 blacks, the margin of sampling error is ±5 percentage points. For results based on the total sample of 906 Hispanics, the margin of sampling error is ±6 percentage points.